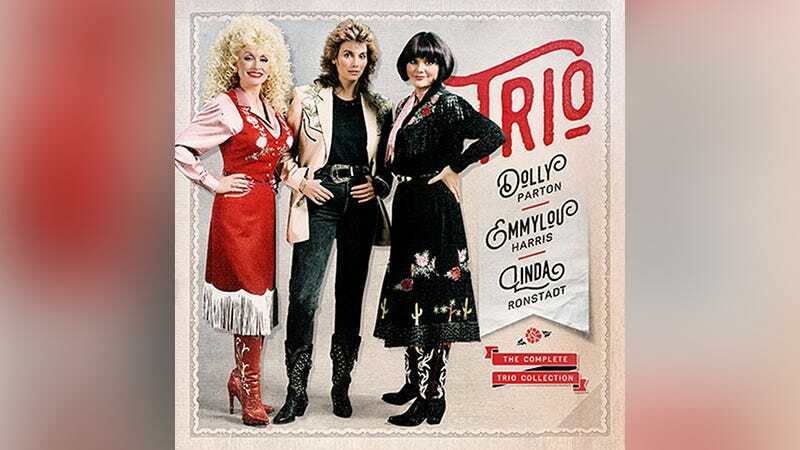 Imagine if someone approached you and asked, “Wanna hear some new music from Dolly Parton, Linda Ronstadt, and Emmylou Harris?” How would you respond? With a silent shrug? A quick “No”? With a gasp, followed by, “What do I look like, some kind of dummy? Of course I wanna hear some new music from Trio!” If it’s more the latter, take a deep breath and prepare your fragile emotions for some great news. Rolling Stone reports today the years-in-the-making Complete Trio Collection will be released this fall, and will include “newly remastered versions” of the gang’s first two albums (Trio and Trio II) along with a disc of previously unreleased tracks and alternate takes. Because Ronstadt can no longer sing (she was diagnosed with Parkinson’s three years ago), this will likely be the last release for one of country music’s most legendary supergroups. A fitting end to their trio of albums.